The harmonic mean of two numbers is in fact the reciprocal of arithmetic mean of the reciprocal of the numbers. This simply means that if H is the harmonic mean between two numbers say a and b then 1/a, 1/H and 1/b are in A.P. 3/ (1/1 + 1/2 + 1/4) = 12/7. Let H be the harmonic mean between two numbers a and b. So, a, H, b are in H.P. This means that 1/a, 1/H, 1/b are in A.P. or, 1/H – 1/a = 1/b – 1/H. On the same lines, we may also find two harmonic means between two numbers. 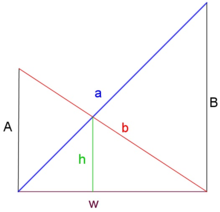 Let us assume that Ha and Hb are two harmonic means between a and b. Then it follows that a, Ha, Hb and b are in H.P. Then 1/a, 1/Ha, 1/Hb, 1/b are in A.P. So, 1/b – 1/a = 3d, where‘d’ denotes the common difference of the A.P. Hence, these are the two harmonic means between a and b.
Harmonic mean is in fact a special case of weighted harmonic mean where all the weights are equal to 1 and is equal to any weighted harmonic mean having all equal weights. The following figure shows two crossed ladders A and B with each having feet at the base of one side wall and one leaning against a wall at height A and the other leaning against the opposite wall at height B. in such a case, h is half the harmonic mean of A and B. Let us find the harmonic mean H of 2, 20, 10, 5, 1 using the formula stated above. 1. First calculate the total number of items which in this case is 5 and hence, N = 5. 2. Now use the formula of harmonic mean i.e. • If a and b are two non-zero numbers, then the harmonic mean of a and b is a number H such that the numbers a, H, b are in H.P. We have H = 1/H = 1/2 (1/a + 1/b) ⇒ H = 2ab/a+b. • If a1, a2, ……, an are n non-zero numbers. then the harmonic mean H of these number is given by 1/H = 1/n (1/a1 + 1/a2 +...+ 1/an). • The n numbers H1, H2, ……, Hn are said to be harmonic means between a and b, if a, H1, H2 ……, Hn, b are in H.P. i.e. if 1/a, 1/H1, 1/H2, ..., 1/Hn, 1/b are in A.P. Let d be the common difference of the A.P., Then 1/b = 1/a + (n+1) d ⇒ d = a–b/(n+1)ab. 1/Hn = 1/a + n(a–b)/(n+1)ab. askIITians offers comprehensive study material which covers all the important topics of IIT JEE Mathematics. The concepts of mean including arithmetic mean, geometric mean and harmonic mean have been covered in detail along with various numerical. It is important to have a strong hold on the topic in order to remain competitive in the JEE. Click here for the Complete Syllabus of IIT JEE Mathematics. Look into the Previous Year Papers with Solutions to get a hint of the kinds of questions asked in the exam. 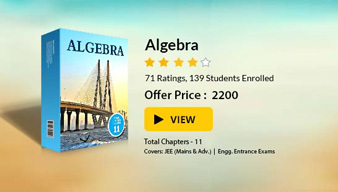 You can get the knowledge of Important Books of Mathematics here. You may also like to refer Arithmetic Mean and Geometric Mean.